Welcome to the introduction to our 2018 annual art exhibition. Our goal for last year’s exhibition was lots of red dots. We achieved this as it was our most successful exhibition to date. Now we need to think how we can continue to grow. One of the ambitions of the FHP trustees is to increase the membership of the Friends. This year let us try to find new members who are also artists and will enter the 2018 exhibition. How do we achieve this? If you know any painter, sculptor or craft person, tell them about the Friends and encourage them to join and also enter the art exhibition. They will have an opportunity to display their work and perhaps also make a sale: in my view a win-win situation. I personally have encouraged one young person to join the Friends, and she is planning to enter a number of sculptures next year. Which brings me to sculptures and ceramics. When I took over the running of the exhibition we had double the number of artists who exhibited sculpture and ceramics. It has puzzled me as to why the number of entries has dropped off. If you have any thoughts or would like to pass on some suggestions, please e-mail me, as I always welcome hearing from any members. Now some very good news: the 2018 art exhibition will be sponsored by Ilchester Estates. They have been undertaking some exciting work, as you will see from the ‘Holland Green’ quarter on Kensington High Street, adjacent to the Design Museum, as well as some other exciting residential projects in the area. We welcome Ilchester Estates’ participation, and look forward to working with them to promote our sensational exhibition. Negotiations are on-going for the 2018 Feature Artist, and it should all be confirmed before Christmas, and details included in your artist letters and next newsletter. As I always say, this exhibition is about friends selling art to friends. Let us the artists support each other and generate more sales and revenue for our charity. The conditions of entry remain unchanged from previous years: Friends who are artists and artists who become Friends are invited to exhibit up to ten works: two framed works to hang on the walls, and up to eight unframed works for display in the portfolio browser stands, these with a maximum size of 70 x 100cm (including mounts, but no wooden mounts please). Friends are also invited to exhibit up to ten three-dimensional objects such as ceramics, glassware and small sculptures, or enter the mini-market of small works on offer at £40 and under, including cards and craft items. The minimum price for works in the main exhibition will be £50. Before registering to exhibit, artists are asked to read 'Information for Artists' which includes the full conditions and requirements for entry. Please note that artists who have registered for the main exhibition may also include small works in the mini-market at no additional cost. Completed order forms should be sent to Rhoddy Wood as soon as possible (please see timetable below) because space is limited, and when enough artists have registered we cannot accept any more. Let’s have a great exhibition with lots of sales. What a great exhibition we had this year: lots of RED DOTS! This was our most successful exhibition. The weather was wonderful and attendances were up. The standard, as usual, was very high, and pricing was spot on. The most important aspect of the exhibition was the spread of sales across so many artists, some who have never sold before, and all were delighted. This is exactly what this exhibition is about. 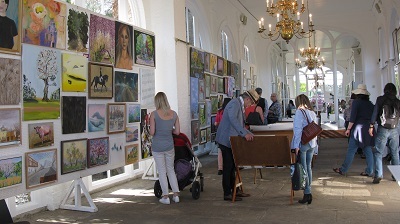 The Orangery is always a magnificent venue, this year with 75 artists, I thought it looked fantastic, with a little more space than in some previous years. The exhibition is a team effort with special thanks going to Alison Beckett for the overall hanging; Alison was assisted by Graham Franklin, Nigel Brockman, Alex French and Neil Gidman. Isabel Langtry, Principal of Hampstead School of Art, judged the exhibition, and we are indebted to her for her time and expertise; and to Rhoddy Wood for organising the Mini-Market, Joy Puritz for co-ordinating our catalogue, Sandra French, everyone who volunteered to steward, and the FHP trustees. Our thanks to our sponsor Romulo Café. This is the second year Rowena and Chris have supported us, and we are extremely grateful. Lastly I would like to thank the artists. This is your exhibition and I want to congratulate you all. See you next year! It was a pleasure to judge ‘The Friends of Holland Park Art Exhibition 2017’. We are so lucky to have such a wonderful park on our doorstep; walking through the park reminds me that it should never be taken for granted. The exhibition was beautifully displayed; I appreciate the great care, attention and energy that putting together such an exhibition demands from its coordinators. Thank you. A range of exciting media and materials were on display, giving me the opportunity to enjoy looking at a rich, varied, mixture of artworks including prints, photographs, painting, ceramics, glass, drawings, 3-D works and decorative jewellery. Malgorzata Lapsa-Malawska was awarded the Prize for Artistic Excellence for her painting If a Tree Falls in a Forest, oil on linen canvas, showing great painting skill and a poetic use of narrative. I am delighted that the Sir Hugh Casson Drawing Prize was awarded to Jennifer Blackburn for her beautiful drawing with paint, an artwork called Beyond the Sky using acrylic and ink. The 3-D Prize was awarded to Angela Wilkes for Bull, modelled in stoneware and beautifully glazed to create a spirited beast reminiscent of the romantic Spanish natural style; and I was delighted to offer the Hampstead School of Art Prize in Applied Arts to Anne Musso for her delicate capture of plants in porcelain: her artwork Lamp, a vertical meadow. Highly commended were Kye Sook Park for her work in the browser which offered a beautiful range of life drawings in the expressive minimal-line style alongside excellent prints; and Judith Gordon particularly for her painting The Dark Hedges, a lovely use of dense and atmospheric watercolour; Mary Romer Greenfield for her painting Rainbow Steps, a composition with a secret narrative of striking colours, skilfully optimistic; Ihor Ropyanyk for the masterly use of oils with palette knife in Wildflowers; Salina Thomas for A Slice of Galicia, its Atlantic waves pulsating with life; Nadhira Benaissa for the photograph of Holland Park Ice House: it is so good to see this local landmark so beautifully captured. Also commended were Russell Mack whose skilful ceramic works are so alluring; Hazel Leach, showing both paintings and ceramics; Alex Longmore showing us how flowers and ceramics work so well together; Susanne Bagner with her beautifully crafted and controlled slumped glass; and Rosamund Lyons, also sharing beautifully coloured glass with us. A special mention at the awards evening was made for all the artists who exhibited; I congratulate you all for submitting work, it is a brave and generous to contribute to an excellent exhibition and support an event that makes such a valuable contribution to our London community. I noted with pleasure the presence of diverse drawing which delights me: the root of all our inspiration. Please continue your practice with vigour; I look forward to seeing your new work alongside new submitters in the exhibition next year. A very special thanks to those of you who buy the artworks, your patronage makes these events possible and gives the event a special buzz, as well as making an important contribution to the excellent work of The Friends of Holland Park. Spring is nearly here which means The Friends of Holland Park Annual Art Exhibition is just around the corner. As well as an outstanding exhibition of paintings, sculptures, cards and craft items, the work of one particular artist is also featured. This year our Feature Artist is Olivia Chalmers, a botanical artist and long-term Friend and exhibitor. Olivia studied at the Harrow School of Art, discovering botanical art after taking classes at the Royal Botanical Gardens in Kew under the renowned Annie Farrar. Olivia’s work is always popular with visitors to the exhibition and her work looks especially fine in the Orangery. Could all artists please ensure that their Exhibit Details Forms are with me by Friday, 10 March, and please indicate which Private View, Friday night or Saturday morning, you would like tickets for, otherwise you will receive none. 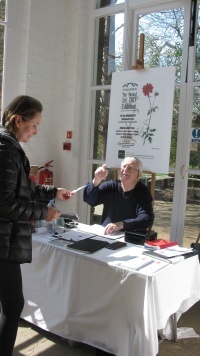 We hope you will support The Friends of Holland Park by visiting our exhibition. We are hoping for more red dots this year. Look forward to seeing you there!